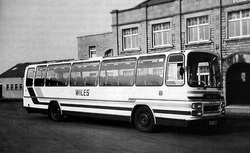 Wiles buses were regularly parked in the Pond Hall car park. On hot summer days queues could be seen at the Pond Entrance, but these days have gone. There is nothing now to attract people to stop, except the Public Convenience !! A community centre was built in the Local park......"Best in the Country" was the words of one local Councillor at at the time. The majority of the funding didn't come from the local council. The hall isn't suitable for any indoor sports.